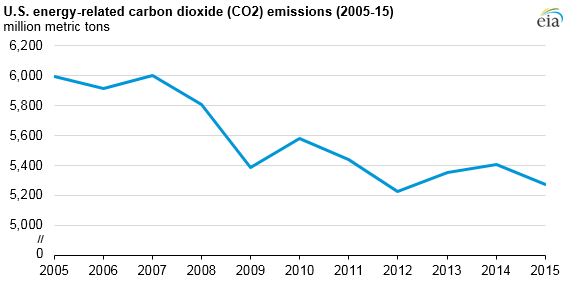 After increasing in 2013 and in 2014, energy-related carbon dioxide (CO2) emissions fell in 2015. In 2015, U.S. energy-related carbon dioxide emissions were 12% below the 2005 levels, mostly because of changes in the electric power sector. Energy-related CO2 emissions can be reduced by consuming less petroleum, coal, and natural gas, or by switching from more carbon-intensive fuels to less carbon-intensive fuels. Many of the changes in energy-related CO2 emissions in recent history have occurred in the electric power sector because of the decreased use of coal and the increased use of natural gas for electricity generation. 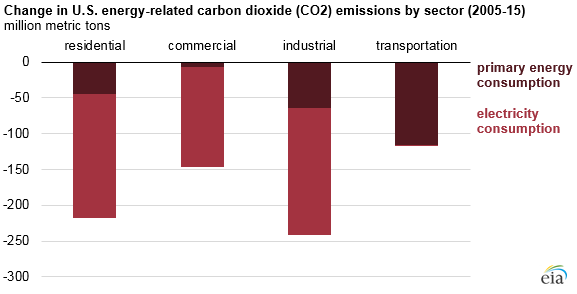 The reductions in CO2 emissions are spread out among the different end-use sectors in proportion to the share of total electricity sales to each sector. Overall, the fuel-use changes in the power sector have accounted for 68% of the total energy-related CO2 reductions from 2005 to 2015. The amount of CO2 emissions in the primary (non-electricity) energy mix of end-use sectors has also changed. In the residential and commercial sectors, primary energy such as natural gas is used mainly for space heating, water heating, and cooking. In the industrial sector, many processes rely on the direct consumption of fossil fuels to produce heat. Most of the energy consumed in the transportation sector is primary energy in the form of motor gasoline, diesel fuel, and jet fuel. Two of the largest factors in year-to-year fluctuations of energy-related CO2 emissions are the economy and the weather. The largest annual decline in energy-related CO2 emissions in the past decade occurred in 2008–09 during the recession. Overall, the U.S. economy has grown even as energy-related CO2 emissions have fallen. Adjusted for inflation, the economy in 2015 was 15% larger than it was in 2005, but the U.S. energy intensities and carbon intensities have both declined. On a per-dollar of gross domestic product (GDP) basis, in 2015, the United States used 15% less energy per unit of GDP and produced 23% fewer energy-related CO2 emissions per unit of GDP, compared with the energy and emissions per dollar of GDP in 2005. Weather also plays a role in annual fluctuations of energy-related CO2 emissions. Heating and cooling degree days measure daily temperature differences compared with a base temperature of 65 degrees Fahrenheit (about 18 degrees Celsius). For instance, a daily average temperature of 45 degrees means 20 heating degree days; a daily average of 85 degrees means 20 cooling degree days. On a population-weighted national basis, the United States has about three times as many heating degree days as cooling degree days. For this reason, annual energy-related CO2 fluctuations are more likely to resemble annual fluctuations in heating degree days. In the past decade, energy-related CO2 emissions and heating degree days were both lowest in 2012.